Wow, MCK Mama that was fast. Why is the bird Ava? Whoa, you are on fire. I believe your surprisingly deft observation skills and keen name etymology insight are worthy of a prize. Don’t you? 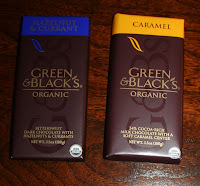 So, I’m sending you a three by six bar of bliss: Green and Black’s organic chocolate. Thanks to Christie and her wonder basket, Green and Black’s have trumped all other contenders to become the 2:00 pm chocolate of choice. It is so very essential to have bite of caffeine the in the early afternoon when the house is quiet and I desperately want to join Ava in the land of nod. And since coffee hates me, I have had no other choice but to turn to chocolate. So name, your Green and Black’s organic chocolate of choice, MCK Mama and I will send it your way. And I’m happy that you think the little red bird looks like Ava too. Speaking of my little bird, I thought that this would be the perfect opportunity to write about the etymology of her name, but I hear her singing her morning song. Why and how Ava got her name will have to wait until tomorrow. I’m sure you all are just perched on the edges of you seat (I promise the Great Purge and the promised contest are coming soon). In the meantime, go and get your hands on some Green and Black’s. Oh, your mouth will be so happy. I’ve never had a Green and Black and now you’ve tempted me. Back in the day when I was eating healthier I allowed myself a bite of dark chocolate a day, I’ll have to restart that tradition! Hold on to yer hats, this is going to be fun! The chance to win something when there isn’t even an official contest being held!? Love it. Oh, of course, it doesn’t hurt that I am the prize winner. Wow. What an unexpected pleasantry to click over and discover! And I just thought you’d (at the very most) be terribly impressed with my bird-watching skills. (And, at the very least, I thought I might be mistaken…though I was pretty sure I read your mind on the bird in tree bit.) But chocolate to boot!? And Green&Black’s!? I’ve only ever had a nibble, as Israel got a bar for Christmas and I’d never heard of G&B’s before. I pick, hmmmmmmm, caramel. Thanks!!!! Ugh, no fair. MCK Mama won and I didn’t even know there was a contest! I’d better stay on my toes while reading this new blog, I guess. Oh, and maybe, just maybe, MCK Mama will share some of her chocolate with me? Maybe MCK Mama will share some with me as well “Jennifer”! Little Ava, little birdie…..she just flies through life! How I love her!